Comprising contributions from a range of experts, this volume offers a critical commentary on the government's sustainable transport policy. A critical commentary on the Blair government's sustainable transport policy and its implementation. Firmly rooted in an appreciation of the politics of this controversial field. Experts contribute up-to-the-minute analyses of the key issues. Will inform debate over the future of transport policy. 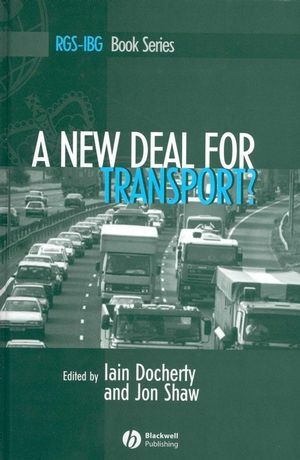 Includes a Foreword by David Begg, Chair of the Commission for Integrated Transport. Iain Docherty is a Research Fellow in the Department of Urban Studies at the University of Glasgow and an expert in urban governance, particularly the implementation of planning and transport policies. His previous publications include Making Tracks (1999), which looks at the transport planning system in major British cities. Jon Shaw is a Lecturer in the Department of Geography and Environment at the University of Aberdeen. His recent work has examined the privatization of British Rail and road building in England. He is the author of Competition, Regulation and the Privatisation of British Rail (2000) and co-editor of All Change: British Railway Privatisation (2000). "This book outlines the political and implementation questions relating to transport policy delivery in the UK. Despite good intentions and a radical policy agenda this book reveals the Labour Government has failed to reduce the need to travel and to improve travel choice. Society has become more car dependent, levels of congestion and unreliability have increased, and the goal of sustainable transport has disappeared. The contributors to this book systematically document and assess the record of the Government on transport over the last six years." "This book is essential reading for anyone with an interest in UK transport policy. It debunks, in forensic detail, the myth that the government has a coherent strategy for transport."